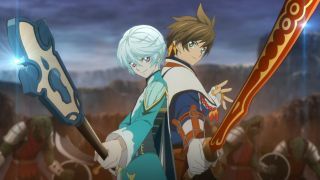 Tales of Zestiria is coming to Steam! And if that rings a bell, it's probably because we actually found out about it back in June. But now we know more, thanks to the official Tales Of blog, which also explains that the PC release will run at 1080p, support 4K resolution, and be locked to a framerate of 30 fps. Okay, that last point might be a little off-putting, but Bandai Namco explained that there's really no other option. "The 'Tales of' battle system has always been an integral part of the gameplay experience, and changing the framerate proved to have profound consequences on things like: animation, balance, difficulty, and overall fighting mechanics tuning," it wrote. "We do this in the best interest for the players’ experience!" The draw distance on the PC release will be double that of the PS3 edition, with a "far" option that will extend it even further. Shadows, antialiasing, and textures have all been upgraded, and players will be able to select a low, medium, or high setting for each graphical option. Tales of Zestiria lists for $50/£40, and will be out on October 20. Bandai Namco will serve up the first look at the PC version of the game during a livestream on Twitch that will include giveaways, an appearance by the Tales of Ambassador, and more, set to take place at 10 am PT on September 24.